The grounds of Horyuji (Horyu Temple) house the world's oldest surviving wooden structure, conveying images of Japan as it existed more than 1,300 years ago, during the Asuka Period (A.D.mid 6th-beginning of 8th c.). The story of Horyuji's founding can be discovered in the historical writings engraved on the back of the halo of the Yakusi Nyorai Buddha statue, located on the eastern side of the room in the temple's Main Hall, and in the official inventory of Horyuji property holdings recorded in 747. According to these records, the emperor Yomei vowed to build a temple and an image of a Buddha as a form of prayer for his own recovery from illness--a vow he was never fated to fulfill, for he died shortly thereafter. These same writings state how Empress Suiko and Crown Prince Shotoku fulfilled Emperor Yomei's deathbed wish by building in 607 a temple and a statue of a Buddha, to which the temple was dedicated. 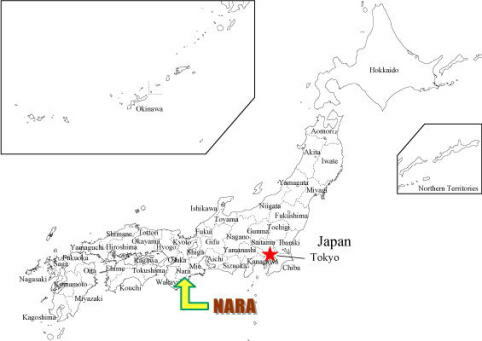 The Buddha statue was of the Yakusi Nyorai (Bhaisajyaguru) -literally, "arrival as a healer"-and the temple was named the Ikaruga Temple (after the name of the location),or Horyuji ("Temple of the Flourishing Law [of Buddhism]"). Today, Horyuji is composed of the Western Precinct (Saiin Garan), which is centered around the Five-Story Pagoda (Goju-no-To) and the Main Hall (Kondo), and the Eastern Precinct (Toin Garan), which is arranged around the Hall of Visions (Yumedono). Throughout the 187,000-square-meter grounds are irreplaceable cultural treasures, bequeathed across the centuries and continuing to preserve the essence of eras spanning the entire journey through Japanese history since the 7th century. In fact, Horyuji contains over 2,300 important cultural and historical structures and articles, including nearly 190 that have been designated as National Treasures or Important Cultural Properties. 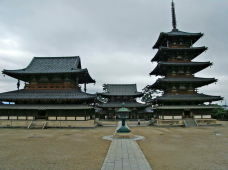 In December of 1993,Horyuji, as a unique storehouse of world Buddhist culture, became the first treasure of any kind in Japan to be selected by UNESCO as part of the World Heritage.